By running these cafes, our service users learn about every aspect of catering and healthy eating. 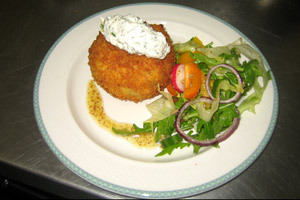 Using fresh ingredients, three course meals are prepared for customers from the local community. This is real ‘hands on’ experience and everyone is involved in the set-up, menu preparation, facility preparation, cooking, taking orders, serving and cleaning up. 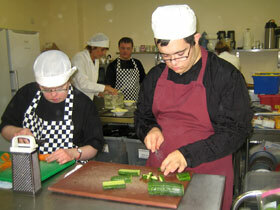 At Stepping Stones we support people to develop their confidence through engaging with the local community. Every week we are exposed to new ingredients, use new methods and see new people. In short, we are constantly being challenged in a supportive and safe environment. The project has gone from strength to strength and we are striving for group members to become trainers themselves, thus inspiring new members through peer mentoring. To achieve this we believe that it is important to work with other agencies and currently five of our group have now taken an NVQ 1 in catering in conjunction with Tamworth College. If you are interested in joining the team, the cafes operate from St James, Mere Green on Mondays and The United Reformed Church, Sutton Coldfield on Thursdays. The opening hours are 9am to 2pm. We also offer buffet services for local functions. If you are interested in ordering a buffet, please contact Steph on 07891 510205.